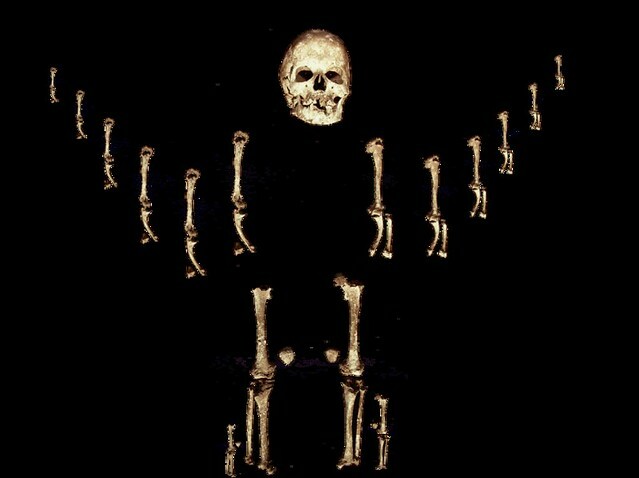 During the excavation of a common grave at Romito Cave in Italy, P. Graziosi discovered the diminutive remains of a person that turned out to be the earliest known case of dwarfism in the human skeletal record. The specimen, known as Romito 2, exhibits features typical of acromesomelic dysplasia, including a high domed skull, compressed cranial base, and extremely shortened diaphyseal lengths. It extends the time span of this genetically determined growth restriction to approximately 10,000 years ago. Besides providing evidence for a greater antiquity of dwarfism than previously known, the fact that this individual reached late adolescence attests to tolerance and compassion of Upper Paleolithic groups for very short individuals. But why should we presume otherwise? In most cases we can mostly only speculate on how little people were treated but let’s be careful with presuming they were treated badly. Such conclusion would probably only reflect our own prejudice. It’s well known that during Egyptian times little people were very highly esteemed managers and caretakers within the royal household, often holding positions that allowed them to acquire wealth and power. Shorter than usual people have been part of human biological and cultural history for a very long time. Dwarfism has infused and enriched our culture. It has expanded the reach of our species (figuratively speaking that is), and it has created the possibility, that hopefully one day soon, we’ll be able to embrace the virtues of a smaller human species. For at least 10.000 years and probably longer, these evolutionary heroes have paved the way, and are still doing so today. ‹Previous Post Thumbs Up for Teens.